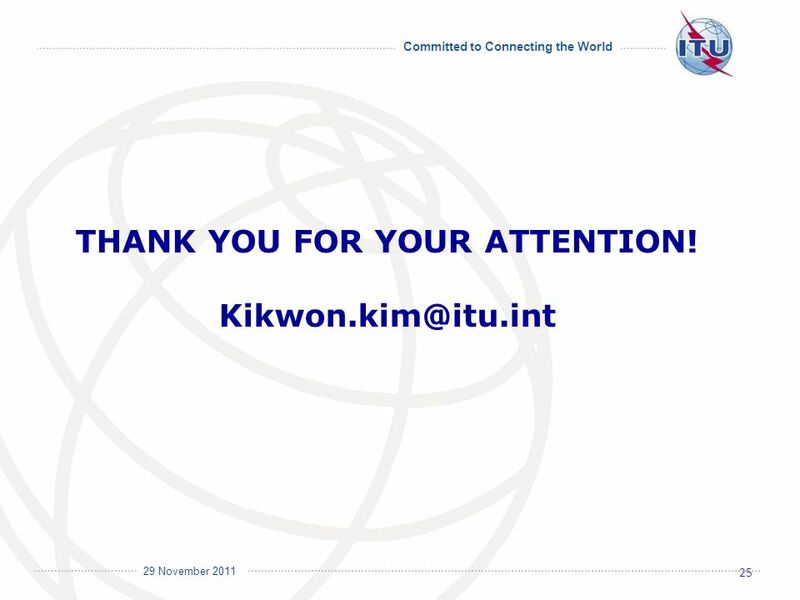 Committed to Connecting the World International Telecommunication Union 29 November 2011 Kim Kikwon Senior Engineer/BDT, ITU ITU Activities on Digital. 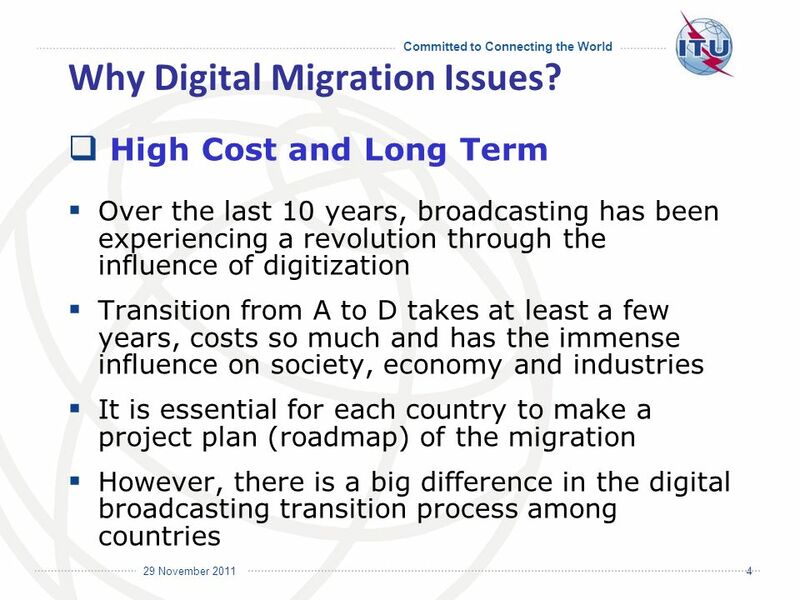 3 Committed to Connecting the World International Telecommunication Union 29 November 2011 3 Why the migration raise issues? 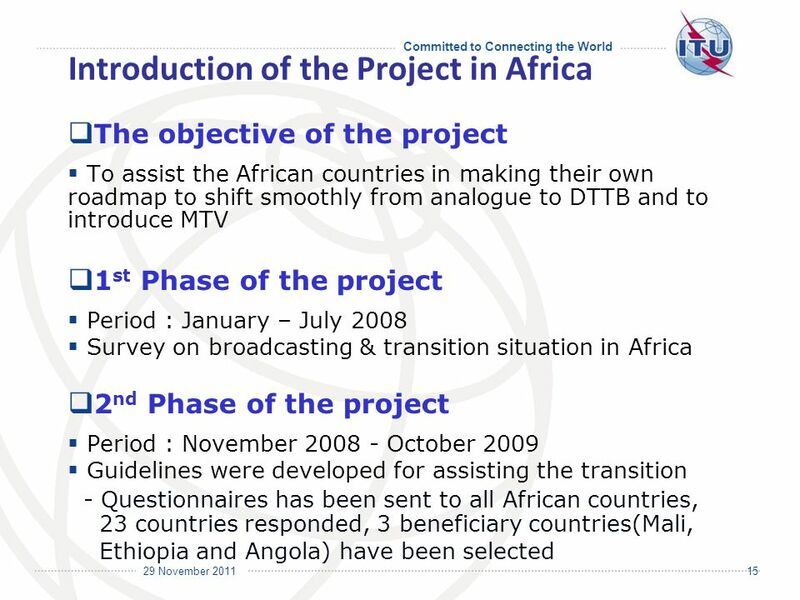 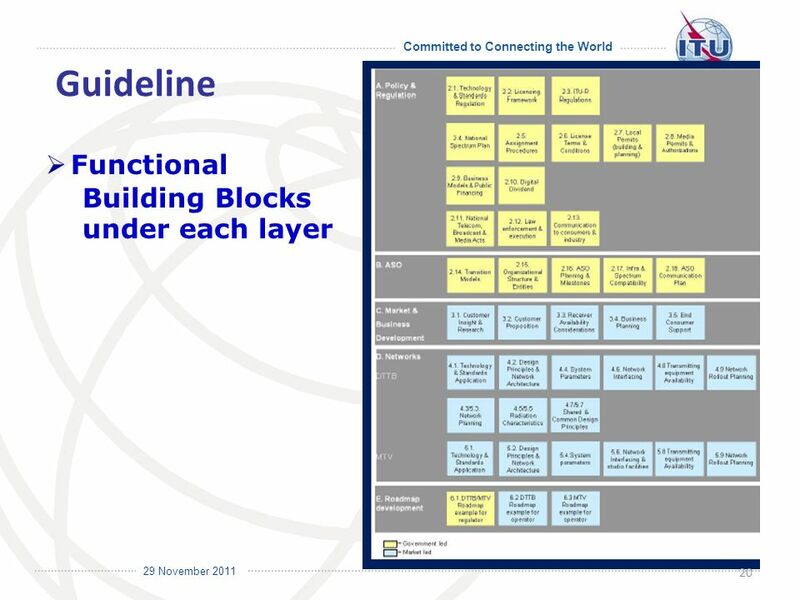 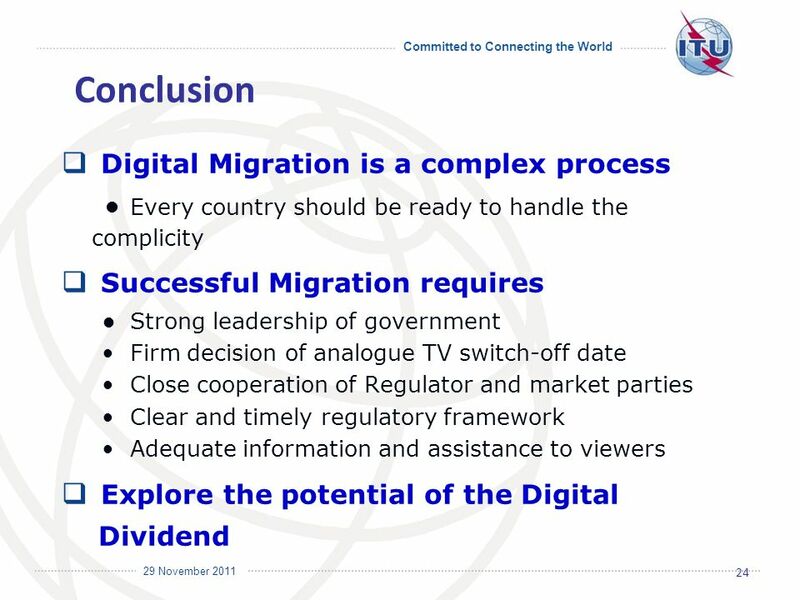 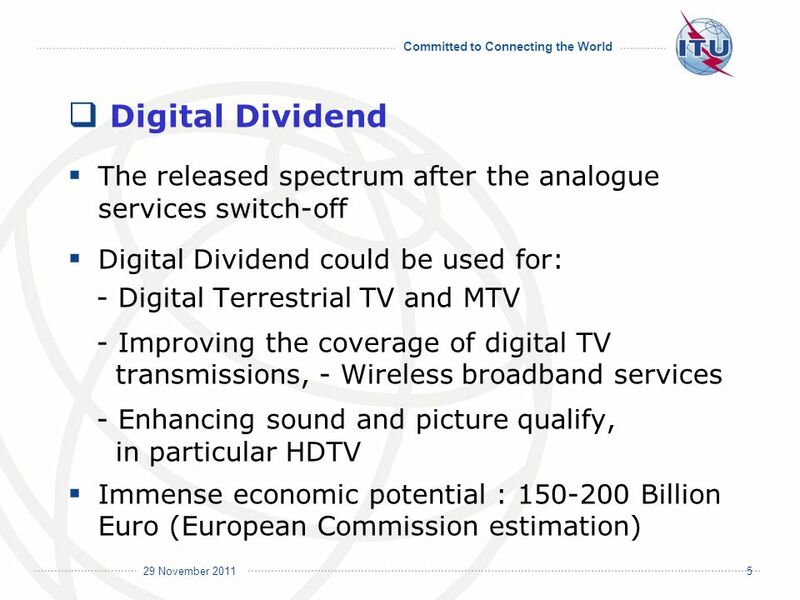 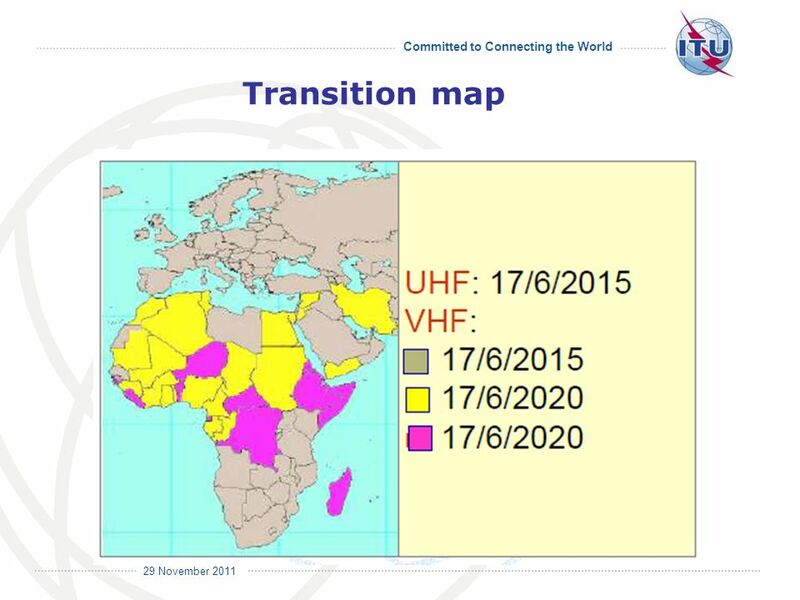 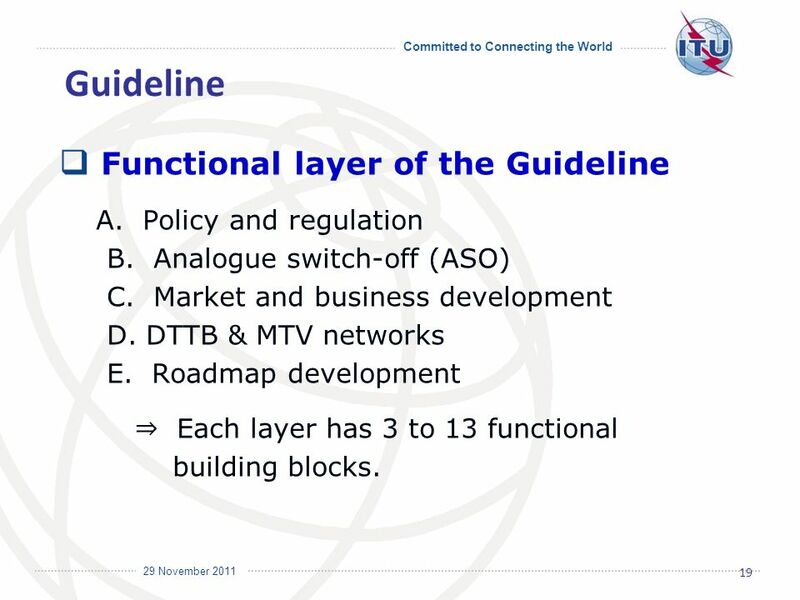 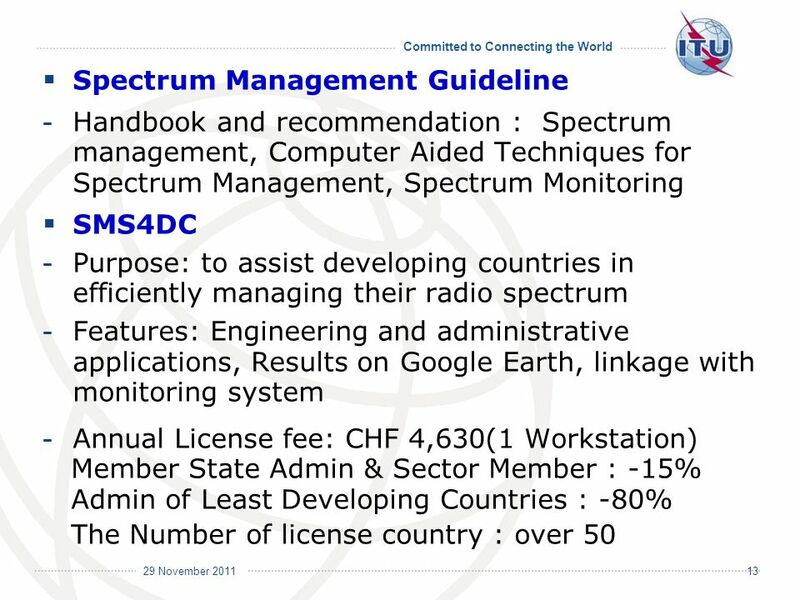 7 Committed to Connecting the World International Telecommunication Union 29 November 2011 GE-06 Agreement : for 120 countries in Europe + Africa The Geneva plan(GE-06) is an all-digital plan for use of the band 3 and 4,5 after the Analogue TV Switch-off. 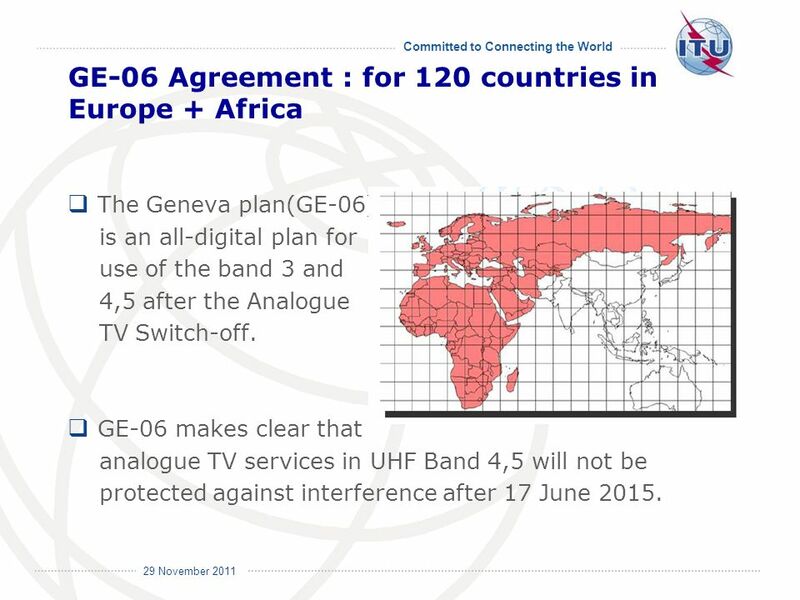 GE-06 makes clear that analogue TV services in UHF Band 4,5 will not be protected against interference after 17 June 2015. 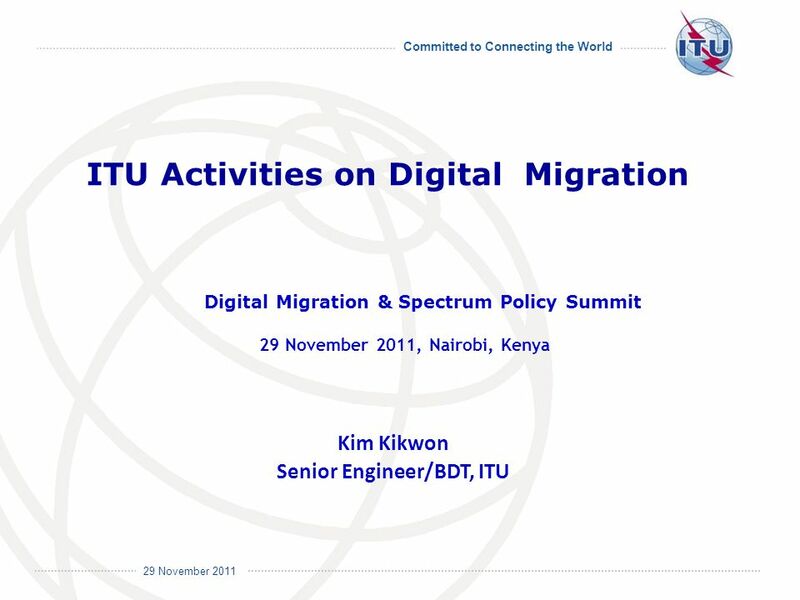 Download ppt "Committed to Connecting the World International Telecommunication Union 29 November 2011 Kim Kikwon Senior Engineer/BDT, ITU ITU Activities on Digital." 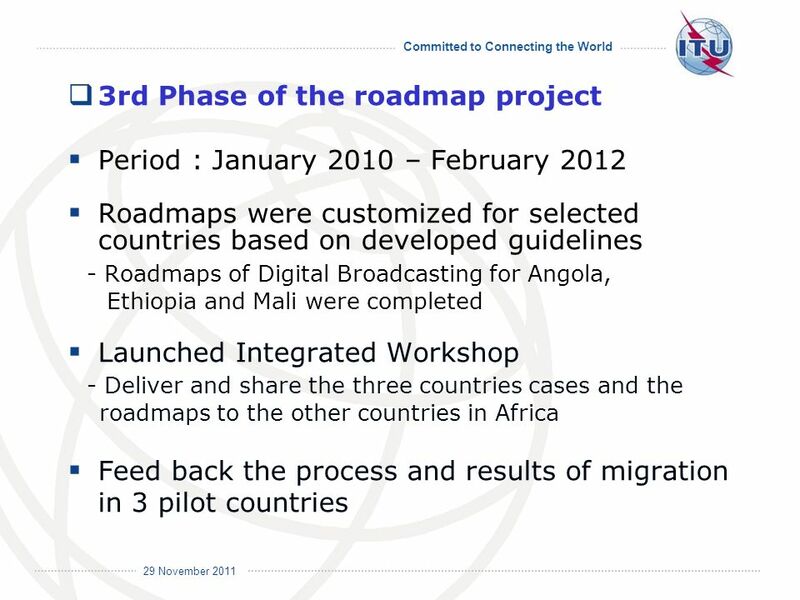 Nairobi, Kenya, 26 – 27July 2010 Role of ITU-T & ITU-R Ahmed ZEDDAM Ahmed ZEDDAM, ITU-T SG5 Chair France Telecom Orange ITU-T Workshop on Delivering Good. 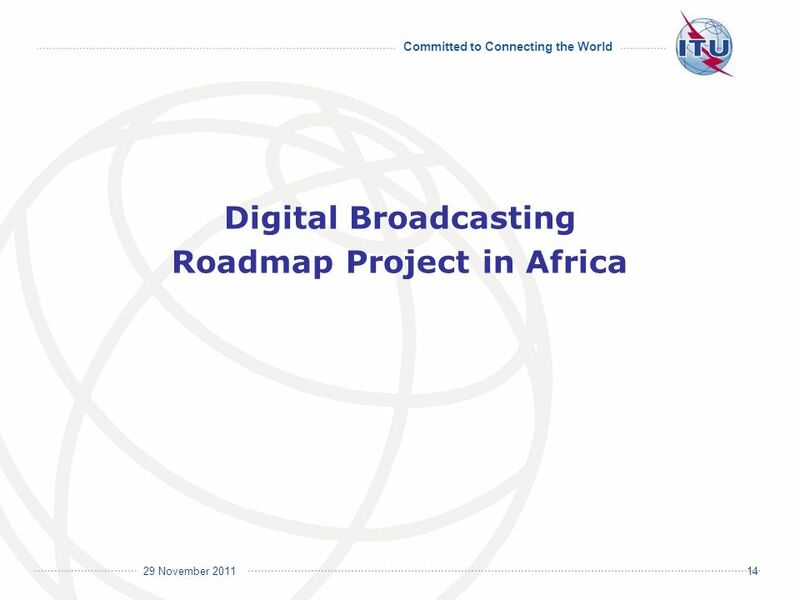 Committed to connecting the world Bridging The Standardization Gap for Africa Africa Regional Preparatory Meeting for WTSA-12 Bridging the standardization. 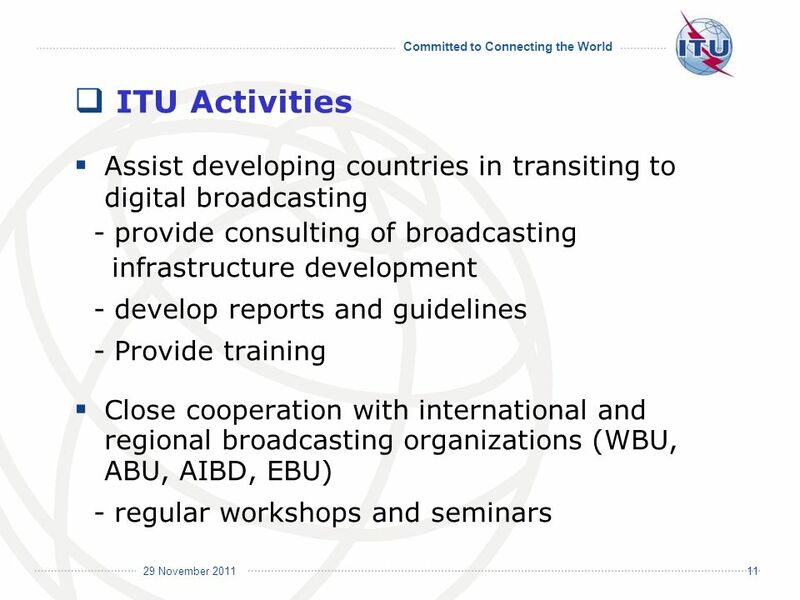 ITU-D STUDY GROUPS A unique and neutral worldwide Forum where developed and developing countries meet to study through Questions matters of priority to. 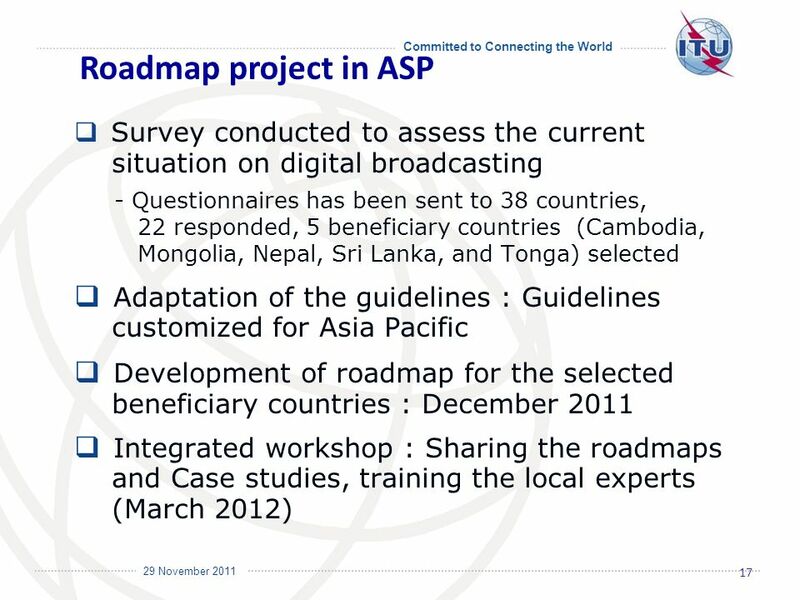 Workshop: The Role of Remote Sensing in Disaster Management, ITU, Geneva, December ITU Activities in Remote Sensing International Telecommunication. 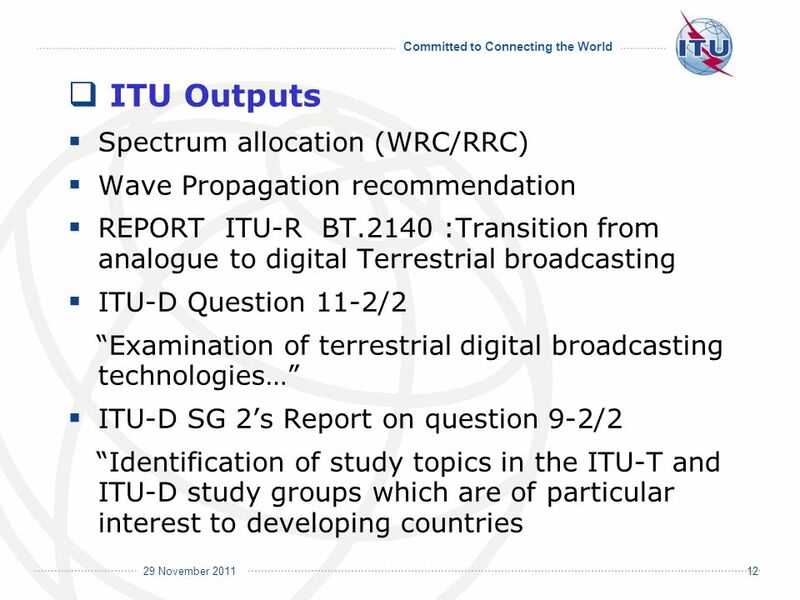 27 April ITU activities for the transition from Analogue to Digital Broadcasting JO, GueJo Senior Engineer On Spectrum Management and Broadcasting. 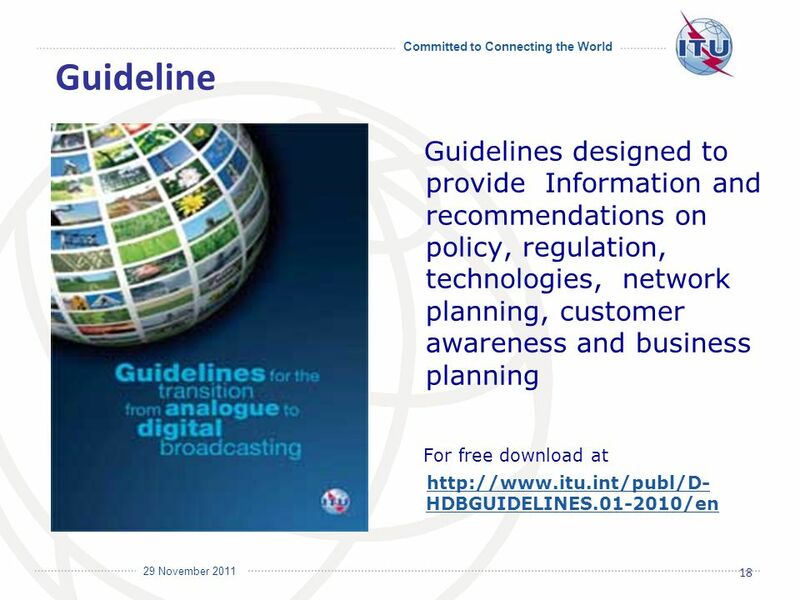 1 Importance and challenges of measuring the information society: ITU and Partnership advances and perspectives Vanessa Gray Market, Economics, Finance. 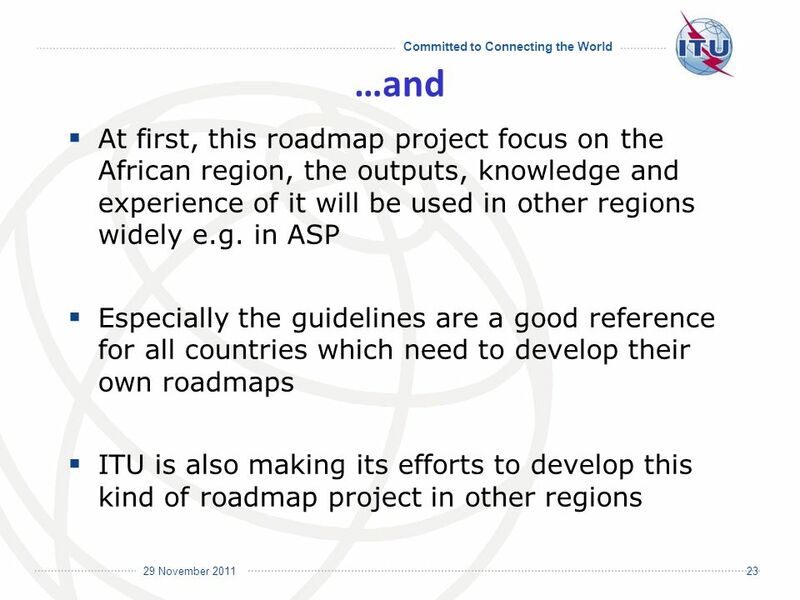 International Telecommunication Union ITU Initiatives within Connect Africa presented by Marcelino Tayob ITU/BDT FTRA 2009 Lusaka, Zambia 20 May 2008.